Guede or Ghede, the alternate names for the God of the Dead, symbolizes the transition between life and death. The name also symbolizes the god of sorcery and tends to mix life with death, which makes him a shrewd trickster. 'Ghede' is mainly known as an undertaker. According to Voodoo beliefs, Gede is an important part of our lives because every one of us would eventually join our dead ancestors who always keep pace with us throughout our entire lives. 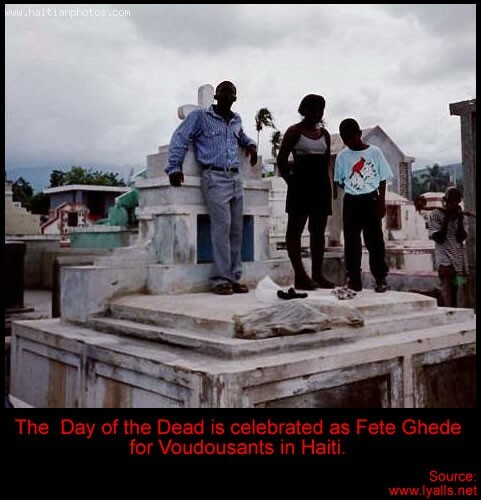 Every year, gedes are feasted on November 2nd; Haitians make annual visit to the cemeteries throughout the country to pay tribute to the spirits and honor Gede. A prolific figure in what some would call Haitian mythology, Lwa Papa Ghede signifies both death, in his form as Baron Samedi, and eroticism in his general form. What he is, is the spirit through which one crosses into the afterlife. He is said to control its access and is, therefore, cloaked in black. If one wishes to have communion with the dead, Ghede would be whom one would need to seek contact with as he is the keeper of the cemetery as well as the only source to the dead. This is not to be confused with Legba who must be contacted to cross into the spirit world. More exotically, Ghede is responsible for the world's eroticism. He is not titillated by it, nor ashamed of it, it is merely a part of existence to him. He is said to hold the more puritanical (especially whites) hostage to their sexual desires as a means of drawing them away from their modesty, a feat which greatly amuses him. He accomplishes this by "mounting" the unsuspecting. November 2nd, is a special day in the Haitian culture. In Haiti as well as in the Diaspora, many Haitians use this time to celebrate Ghede with dances and Voodoo ceremonies. Ghede, Doesn't the "Pimen" burn after the Lwa is Gone? Like 99% of Haitians, I believe in the Haitian Voodoo. I have observed people being possessed by Lwas. On this November 2, this is high time for Ghede tradition where the "Randed-Vous" is at various Cemeteries around the country. Baron Samedi will be everywhere, dancing, drinking and performing a variety of acts that would only be allowed on this day of Ghede. One thing that I am always puzzled about during Ghede is the phenomenon of washing oneself with Hot Pepper, In Haitian Creole, "Pimen". Usually, the people who are possessed by "Papa Ghede" or "Baron Samedi" make sure that the Hot pepper is inserted in their sexual organ. The Ghede (often spelled as Gede or Guédé) Lwa families in Haiti practice powers of life, death and fertility through Haitian Vodou. They serve as the intermediaries between the creator god or the good god (Bon Dieu or Bondye) and humanity. Ghede means 'the sacred dead'. "Lwa" often referred as 'Mystères and the Invisibles'-- are the spirits of Haitian Vodou. Fete Ghede or Gede Festival is a past-honoring event also known as the 'Festival of the Ancestors' performed on Second November every year in the honor of the 'Lord of the Dead'. It is the day to repay the boons granted by Ghede otherwise they will take revenge on you. During the ceremonies of Fete Ghede, there is always a spiritual procession to the cemetery. The women spiritual adepts are called 'mambos' and their male counterparts are known as 'houngans'. They join drummers and singers at the festivals and pray at a cross rising from a tomb; summon the spirits before the party begins. The day of the dead might strike the ignorant as a macabre event, especially in Haiti where the November 1st and 2nd celebration is intricately linked with Vodou. But the practice, shared by other countries such as Mexico and Guatemala, with roots as far-reaching into history the Aztec civilization, though called by other names in different locales, is not so much a dark, pagan ritual as a joyous celebration of the life of lost ancestors. 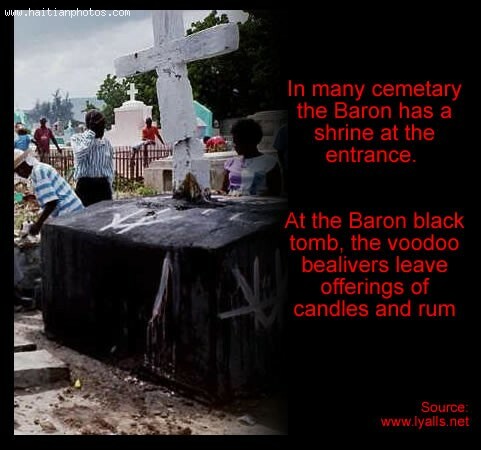 Hundreds of practitioners of the Vodou and Christian persuasion flock cemeteries and light homemade candles, strew flowers, and offer food and alcohol to the spirits Ghede and Baron Samdi. And since Vodou's legalization in 2003, the ceremonies have become more accessible and certainly more attractive to tourists wanting to witness the cultural spectacle. Haitians may not celebrate Halloween but they do have a holiday called Ghede. This is the day of the dead, when Haitians remember their deceased relatives and ancestors every November 2. Some Haitians describe Ghede as a New Year celebration for the dead because of the festivities and activities during the holiday. Ghede is a huge part of the Vodun tradition, which calls for celebration and tribute to Ghede spirits. Baron Samedi is the God of Death and the leader of Ghede spirits, which are among the pantheon of Gods called as Loa. 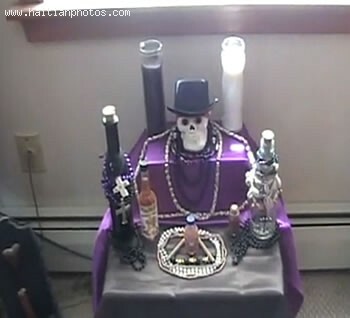 Haitians pay their respects to Baron Samedi, who they see as the wisest adviser, protector of children and the last hope of the sick. When it comes to Voodoo mythology in Haiti, Ghede is one the most prominent figures. Ghede is the God of Death who stands and guards the eternal crossroads, where the dead passes to go to a place called Guinee. This place is the home of the gods. Ghede is described as a figure wearing long black coat and donning black top hat and dark glasses. Being the God of Death who knows everything about the deceased, Ghede is considered the wisest among the Voodoo gods. Ironically, Ghede is also recognized as the Lord of Life. He sustains people's lives and oversees their reproduction. He also has the power to bring back the dead through resurrection. Aside from being the God of Death and Life, Ghede is also the God of Love. No one can control Ghede's followers but himself. The Voodoo spirit masters, who are also called the Hougans, do not have power over Ghede.